Rewind back to the early 90’s and who would have imagined a world where consumers are shopping from those rectangular objects namely their laptops or smartphones rather than going to stores. While this scenario was totally unfathomable, it is practically a norm now. India is at a juncture where the eCommerce industry is poised for phenomenal growth backed by increasing smartphone and internet diffusion in the remotest areas. Add to this the introduction of 3G and 4G services & at affordable prices that eCommerce industries are set to witness even a higher growth. With consumers getting ever comfortable with the idea of online retail, there has never been a better time to start an eCommerce business in India. 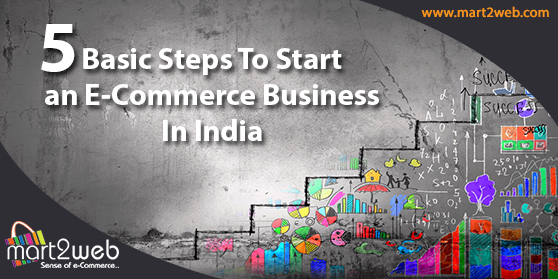 Outlined here are five basic steps that will get you covered in your quest to start an eCommerce business in India. Creating a website – First things first, your eCommerce venture will have to start with investing in a website. Your website is like the online representation of your own store. So, make sure you do a great job at it. Ensure that the name of your website resonates with your brand, your product and your own self. This is what your consumers will come to identify you with, and eventually help build a better business and sales. Building your website – Creating a website is just the tip of the iceberg, it will be all that goes into it. Your product, the landing page of your website, product catalogues, the images used with the supporting audio and visual will have to be customer friendly, eye catching and appealing to start the cash registers ringing. Perfecting your SEO – It will be only wise if you started implementing SEO techniques and methodologies right from the very start of your set up. You will need to optimize every product and section name which will turn up organically on search engines. Natural searches are one of the best driving force of sales. Ensure that you are well tuned in with what customers are looking for and use keywords based on these trends. Get social media savvy – Today the entire world and its cousin is a part of the social media scene. Here you have an excellent platform to reach out to potential customers, with you a well-planned strategy and constant social media presence you can create a strong audience base and a dedicated set of customers. Your social media marketing strategy should include promotions, discounts, special offers, as well as addressing grievances, suggestions and live chats with your customers. Engaging in this regularly is sure to increase the customer trust in your brand. The above steps are basic but essential elements for an eCommerce business. Many a times businesses flounder simply because they do not have the necessary skills or expertise to implement these. This is the very reason why you should invest engage with a eCommerce software company to assist you with all that you need. Mart2Web is a leading eCommerce software company in India, specializing in all the features and functionalities. Mart2Web has all the necessary eCommerce software features guaranteed to give an exclusive look to your website. With their wide range of mobile responsive templates, SEO techniques and methodologies, inbuilt social media applications, integrated payment gateways, inventory management and all the latest in trends and technologies your website will have a firm footing in the eCommerce business.